Our Woodsman’s Weather sticks have been predicting the weather, delighting their owners, and amazing new acquaintances all around the world for over ten years. Long before that the Abanaki Indians probably used them as hostess gifts when they went to dinner in neighboring wigwams! Hang on an outside wall or door casing exposed to the weather, stick bends down to foretell foul weather up for fair (unless you’ve hung it upside down – the hole goes on top)! approximately 12″ – 16″ long. Each stick comes packaged with story of weather stick and simple instructions. A fascinating and beautiful way to predict how the weather changes. Fill the bulb of the glass barometer with water using the included syringe (use food dye to color the water) .The water in the stem will rise and fall with the air pressure, giving you a nifty . Attractive to look at, it is also functional: when the barometric pressure us high, the liquid is pushed down the stem. When pressure drops the liquid in the stem rises and it could mean stormy weather! Inside the teardrop shaped glass are crystals that form, dissolve, grow, and shrink depending on the weather conditions. Different conditions will produce different crystal shapes and patterns. It was once believed that these 'Storm Glasses' could predict the weather patterns. Sadly they are not as reliable at that duty as was hoped. But their changing appearance has made them a popular piece of visual art nontheless. 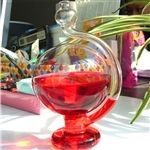 Glass is 5" tall and 2-1/2" in diameter at its widest point.